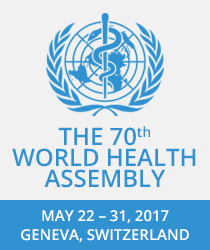 The World Health Assembly took place 22-31 May in Geneva and a number of reports and documents were discussed at the WHA related to sexual and reproductive health and rights, which can be helpful for Share-Net members (both for programmatic and for advocacy work in the global south!). The Secretariat developed a report on progress of implementation of the GSWCAH, focusing specifically on adolescents’ health to the member states (A70/37). In the Annex of the report, it refers to the work of the High-level Working Group on the Health and Human Rights of Women, Children and Adolescents. This working group was launched in 2016 and is an important new collaboration between WHO and OHCHR to increase attention to the rights-based approach to health, including SRHR. At the WHA, the Working Group launched their first report with concrete recommendations to member states to ‘realize the human right to health and through health’ – including on for instance data collection, reporting on right to (sexual and reproductive) health. You can read their full report here – an amazing piece of work!! In addition, the GSWCAH report refers to the newly developed Global Accelerated Action for the Health of Adolescents (AA-HA!) Guidance to Support Country Implementation. This practical guidance document was launched in Canada earlier in April, and provides governments/ministries with very concrete and evidence-based support to improve their national adolescent health strategies. Hence, a very important (advocacy) tool indeed!! At the WHA in 2016, a resolution was adopted that included the commitment to review progress on SDG 3 every year at the WHA. Therefore in preparation for the WHA of 2017, a report was developed (A70/35). Although the report briefly discusses progress in relation to improving access to sexual and reproductive health services, it fails to make the linkage with SDG 5 on gender equality and reproductive rights. The Netherlands joined a number of other member states to call for a more comprehensive review of SRHR in future reports.